Witnesses say the monster president ripped the roof off the Bureau of Engraving and Printing, grabbed millions in currency from within, and crammed it down dozens of citizens’ throats. WASHINGTON—Still overcome with shock and terror as they described the horrifying scene that had unfolded before them, numerous eyewitnesses confirmed Thursday that, after being accidentally exposed to an experimental job-growth chemical, Barack Obama has grotesquely mutated into a 20-foot-tall monster president. According to federal officials, the grisly metamorphosis took place during a tour of the Labor Department’s underground research and development lab, where a sudden pressure overload caused a vat to rupture, soaking Obama in a highly unstable serum designed to expand the nation’s workforce. Sources said the president then underwent rapid, out-of-control growth, leaving him several times larger and uncontrollably aggressive. Authorities at the scene said chunks of limestone and steel flew in every direction as Obama burst through the outer wall of the Labor Department headquarters and began charging west down Constitution Avenue. The rampaging president was seen smashing cars with his fists and tearing down power lines in rage as he made a direct path toward the Federal Reserve Board building, where several police units reportedly opened fire on him only to watch their bullets bounce harmlessly off his impervious skin. According to witness accounts, the colossal presidential monster then punched down the doors of the building, grabbed cowering Fed chair Janet Yellen by the neck, and demanded in a deafening bellow that she cut interest rates to spur job growth before hurling her flimsy body into the nearby Reflecting Pool. Labor Department scientists told reporters that just a single small dose of the chemical Obama was exposed to is capable of producing more than 600,000 jobs per month, enough to counteract even the worst recessions, but in great concentrations the caustic agent can be extremely volatile. Analysts noted that it has never before been deployed in such quantities, adding that the nation’s employment, production, and income outlook under the angry mutant president is beyond the scope of any economic theory. With local law enforcement seemingly powerless to stop him, the towering, muscle-bound president reportedly escaped the Beltway and bolted northward at a tremendous speed. 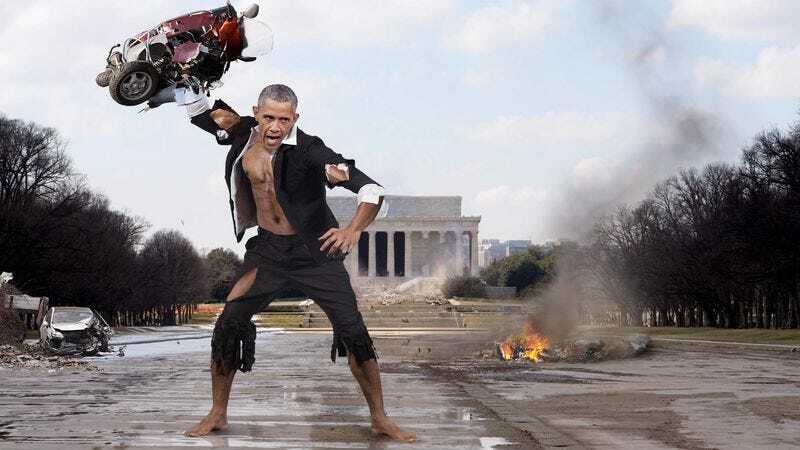 Sources stated that Obama did not stop running until he reached the New York Stock Exchange, where he tore through a wall and began violently ringing the opening bell while screaming about foreign direct investment. According to those present, a visibly enraged Obama demanded more American jobs and less outsourcing, shouting “Buy, buy, buy!” and “No selling!” as he smashed video monitors and crushed any traders who did not immediately comply. His feats of economic strength growing with his anger, the president is said to have then thrown a city bus into the Lower Manhattan offices of the Securities and Exchange Commission before proceeding to pick up several armored cars and violently shake them until the currency inside fell to the ground and was collected by passing consumers. At press time, Grass confirmed Obama had been captured and sealed in a prison cell with 10-foot titanium walls in southeastern Michigan, as far from the U.S. economy as possible.